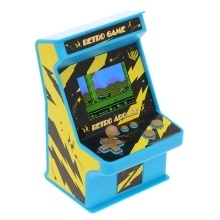 Classic arcade game machine appearance design recalls your childhood memory. Built-in 256 games offers you great happiness during leisure time. A perfet gift for kids and friends. 256 different classic games preinstalled in the machine, fun and challenging. With AV out function, you can play games on TV and enjoy big screen visual experience. Equipped with a wired gamepad, share happiness with your friends and enjoy a great time. Dual power supply, 4 * AA batteries supply or DC 5V supply, offering endless happiness.